Hillsboro High School is currently undergoing renovations set to be completed by 2020. How do they change the time on the outside clock at Hillsboro High School? Williams works across the street at Macy’s and can see the clock from the store’s window. He said that when daylight saving time came around, he noticed that it was the right time. “The question just popped in my head. How does that happen?” Williams said. Seemingly a simple question. But after a little digging, Curious Nashville found a little-known history behind the clock, which remains relevant today as the school undergoes a major renovation. 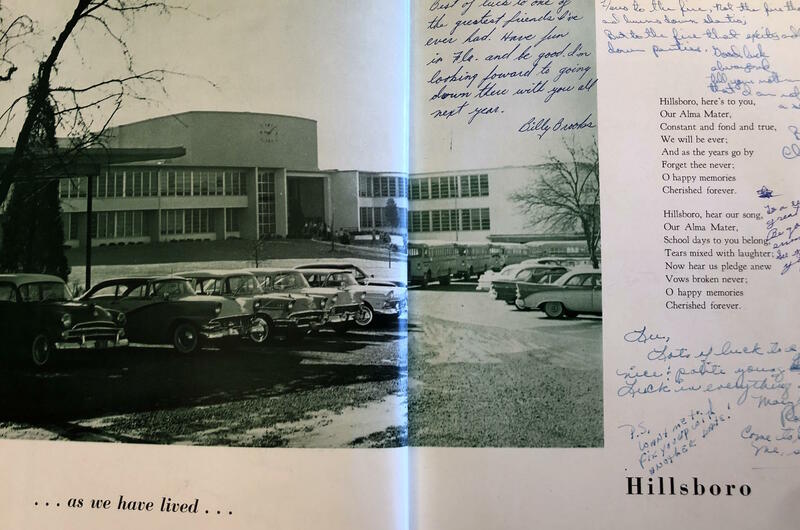 The clock was the focus point of the 1958 yearbook. 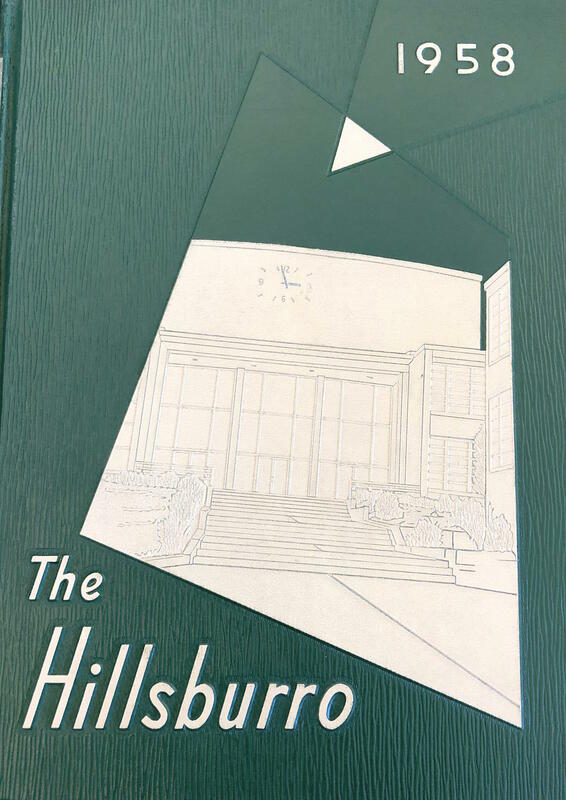 Hillsboro High School was originally built in 1939. But the clock wasn’t there at the beginning. Documents at the Metro Archives show that the first building burned down in 1952 and the school that stands now was built in 1954. Nashville architect Edwin Keeble designed the replacement. Keeble is known for designing buildings all over city like the Woodmont Christian Church and the L&C Tower downtown, the city’s first skyscraper. The school’s Mid-Century Modern civic architecture gives the school its unique look, and actually lands it on a list of Nashville’s historic proerties. But the clock in question wasn’t in Keeble’s original design either. Evidence of it doesn’t appear in any documentation until the late '50s. But why was it added? An incident in 1955 forever changed the school’s facade. 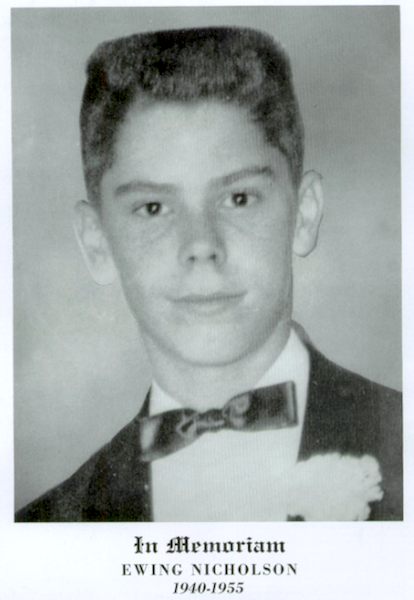 Ewing Nicholson Jr. was about to be a sophomore at Hillsboro High the summer of 1955, a year after the school was rebuilt. But he didn’t return to classes that fall with the rest of his peers. Ewing Nicholson Jr. was a rising sophomore at Hillsboro High School at the time of the accident. He would have graduated in 1958. On July 17, 1955, Ewing and his friend Bobby Johnston were having target practice on Ewing’s family farm. The boys were shooting tin cans. When Ewing went to straighten the cans, Bobby accidentally fired his rifle, hitting his friend in the chest. He died before he could be taken to the hospital that Sunday afternoon. The Tennessean reported the teen’s death the following day, but the incident generated little attention after that. That is, until his classmates prepared to graduate in 1958, when the clock — measuring 7 feet by 10 feet — was put up in his memory. The newspaper soon published a photo showing the clock hands being changed manually by a man on a ladder. The clock also received prominent placement on the cover of the 1958 yearbook, with a full memoriam page for Ewing inside. This story has been largely lost over time. Even Hillsboro’s current executive principal, Andrew Pelham, wasn’t aware of the history of the clock, or the specifics about how it’s maintained. He, too, became curious. Pelham said that the clock always seems to have the right time. And while its hands were once changed by hand, the principal knew that was no longer the case. Fortunately, changing the clock hands is fairly simple now. After a few updates, Metro Schools created a system that would allow a technician to adjust the clock from inside the building if needed. The clock recently got another update and now has a new automatic timer. Super easy and safe. For the first time since 1995, the school is currently undergoing additions and renovations. Some Nashvillians are worried the reconstruction will give the school a more suburban look and take away from the original design. The iconic exterior clock was put in place during the 1957-1958 school year. It will remain a part of the school after the renovations are complete. The $88 million project started construction early last year, and the district wants the renovation completed by 2020. Hillsboro High will get a new four-story school building, a new football stadium, a parking garage, tennis court and softball field. Most of the work on the existing building will be internal. The good news is, with all of these new additions, the noteworthy clock will remain the same — visible to all the passers-by, and still visible to David Williams working across the street.